The weatherboard dwelling began life as Egroeg and later became Rothesay Farm before the name was changed to Aldgate House. 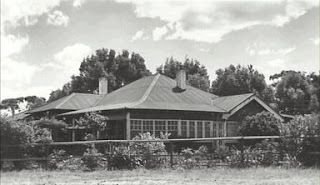 The cottage, which still stands in Macquarie Road, was built in the 1930s to a Varney Parkes (son of Sir Henry) design. Originally, the land upon which it stands formed part of the Fels property before it was sub-divided by Dora Fels in the 1920s. Albert Thompson, land developer, purchased the portion where Aldgate house now stands but by the 1930s David and Florence Drake were the owners. The Drake family built Egroeg (George backwards) which is thought to have been named for their son. Drake only owned the property for a couple of years because Richard Bowles was the owner by1933. Bowles altered the name of the home to Rothesay Farm, which perhaps better reflected its use as a farm style guesthouse. The situation remained unaltered until 1942, when the residence became a holiday home for children from the far west. Its use changed again in 1989, when it was opened as an art/craft gallery by Barbara Ryder and Anne Marvell. The name was altered by the new proprietors to Aldgate House. Aldgate is thought to have been their previous home in South Australia. Photograph by courtesy of BMCC Image library, photographer Murray Views, Gympie Qld.